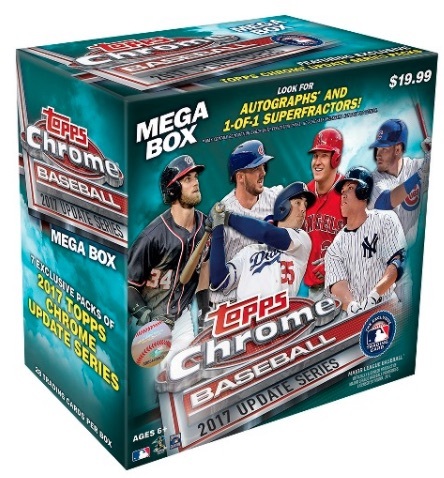 Adding Chrome technology to Update Series via the exclusive Mega Box format, 2017 Topps Chrome Update Series Baseball provides a holiday extension of sorts, only found at Target locations. The 2017 Topps Chrome Update Series checklist relies on the main 2017 Update lineup to fill out the shiny base set. However, they are very easy to distinguish given the chromium treatment and #HMT prefix for the card number. There are also limited Refractors that average around 1:3 boxes, along with low-numbered X-Fractor, Gold Refractor, Red Refractor, SuperFractor, and Printing Plate parallels. Autographs are a bit tougher at roughly 1:8 boxes, and also joined by X-Fractor, Gold Refractor, Red Refractor, SuperFractor, and Printing Plate editions. The main insert, falling in every other pack, is Topps All-Rookie Cup. These reprints have limited Autograph versions, as well. Full 2017 Topps Chrome Update pack odds are available on the checklist tab above. Unlike previous sets, it appears that the retail-only release does not mix in regular Update packs this time. 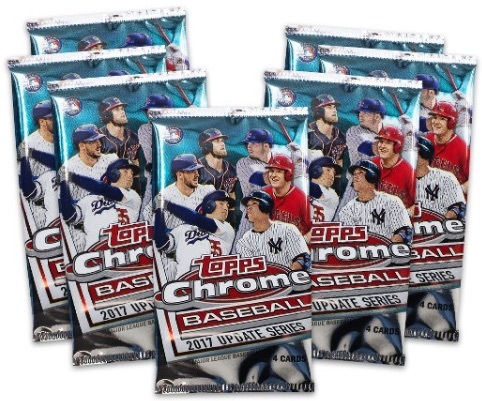 Every Mega Box of 2017 Topps Chrome Update Series Baseball includes seven chromium packs, each with four cards, for a listed retail price of $19.99. AARON JUDGE 2017 TOPPS CHROME UPDATE ROOKIE RC NY YANKEES ** BGS 9.5 ** GEM MT!! RC = Rookie Card, RD = Rookie Debut, AS = All-Star. PARALLEL CARDS: Refractor #/250 (1:22), X-Fractor #/99 (1:56), Gold Refractor #/50 (1:110), Red Refractor #/25 (1:220), SuperFractor 1/1 (1:5,529), Printing Plates 1/1 (1:1,375). 61 cards. 1:56 packs. Shop on eBay. PARALLEL CARDS: X-Fractor #/99 (1:165), Gold Refractor #/50 (1:240), Red Refractor #/25 (1:449), SuperFractor 1/1 (1:9,909), Printing Plates 1/1 (1:2,501). 20 cards. 1:2 packs. Shop on eBay. 15 cards. Serial numbered. 1:7,195 packs. 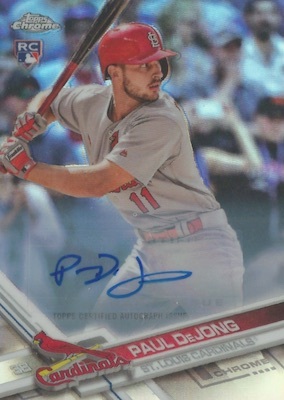 It would be nice if Topps would come up with some new pics for their Chrome update. It is still a nice set but nothing to write home to Grandma about. The information on the 2017 Topps Chrome update set says there is only 4 serial numbered colored refractors. I have a purple refractor serial numbered to 250 that is not listed as part of this set according to the write-up about it inthe product details. Does anybody know anything about any other colored serial-numbered refractors in this set? James: This info came straight from Topps and the specifics for the parallels are confirmed from the box odds and cards online. You pulled a Purple parallel from a box of Chrome Update? I purchased it on eBay and it is serial numbered to 225 and has a purplish color on the front in the background. Hope this helps you out. I’m just wondering if there are any green and blue parallel refractors as well. We do our best to pass along details provided without making assumptions. Info was initially vague about what was numbered. This is now fully clarified on the checklist tab with complete pack odds and print runs. You most definitely have the base Refractor as there is no Purple parallel in this set. So far I absolutely love this product. I have purchased a total of 4 mega boxes at my local target and will most likely be going back to grab a few more. They sell them “on sale” for $17.99. I lucked out and hit a Trey Mancini Red Refractor Autograph /25. For a retail exclusive product, this product is delivering big time. Saw a video of a guy pull two autos out of one mega box, one being a Bellinger Gold Auto. My only gripe/concern is some of the cards appear to be misprinted. For example I have three Yoan Moncada cards and one has what looks to be the printing of a different card at the top of the card. Any idea if this is just a misprint. Am I just overthinking this and its a basic error, or are there going to be a lot of these cards floating around? I have about 5-6 cards with the same printing error. I ended up hitting a Betances refractor /99 and an Eaton numbered to 250 while also pulling 3 Judge Base Rookies and 2 Bellingers. I’ll obviously be able to cover the cost of my boxes with just the auto, but the inserts and numbered cards will cover at least 2 boxes as well. Very nice! I like this product. The cards have that nice Chrome look and feel. Some of the Topps All-Star Rookie reprint cards are spectacular and the refractors are sharp. It’s a simple set — base 1-100, refractor and auto parallels, and 20 Topps All-Rookie Cup reprint inserts. 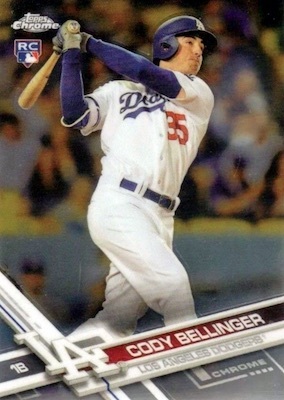 In what I’ve seen, there is way too much duplication of the base packs from box to box, but at least every one has some sort of Judge or Bellinger RC. I even pulled a redemption for a Judge auto — totally awesome!!! Anyhow, the price is reasonable and the set is loaded with rookies and stars. This would make a nice gift for a kid (like one of my nephews) or an adult (like me lol) who enjoys collecting baseball cards. Overall I give it 4 out of 5 stars. 1) Any idea what the significance of the numbering is? HMT? Can’t think of what that stands for for the life of me! 2) I’ve noticed that Topps will add some rookies to the initial Chrome base set, like Jesse Winker for example. So it’s odd when they make a Chrome version of his Update card, thus giving him 2 chrome true rookie cards. The Chrome Update card is a true rookie, not a Rookie Debut. Odd. It must be a special promo this weekend. I got 3 mega boxes and each one rang up as 17.99 with an additional 4.50 off each box. 3 for under 40 bucks. Lets see what I pull. @Jeremy D: The HMT stands for Holiday MegaBox Target. It’s a special blaster available at Target during the holidays. There’s also a different set found at Walmarts, and they’ll have a HMW prefix. @Ricky: Topps cards were 10% off this week, and today only there was a special promotion of 25% off toys (which includes sports cards). Hey Trey, take a look at a Ian Happ RC refractor serial numbered to 250 and tell me that it does not refract purple. As a matter of fact, it’s the only color it does refract. I understand that it is a standard refractor but if you look at 1 you would swear it is a purple refractor. Even in the artwork where it looks like a ray of sun coming from above, it is light purple. Thanks for the follow up, check one out sometime if you get a chance. I’ve open 30-35 boxes. Impressed. Pulled roughly 50 Judge/Bellinger Rookies. One Bellinger was /250 , pulled 2 printing plates autographs 1/1 (1:2600) , Bregman and Luis Castillo. Quite a few Xfractors /99 and a lot of low Numbered color and several autographs. I never usually break even but ended up ahead this time. Oh and Pulled a Redemption for a Benintendi Xfractor Autograph parallel. I certainly don’t think they are worthless, but I’d always prefer hard-signed to a sticker. They are just much easier to obtain and use for future sets, so it can save the card companies a lot of time. Most collectors prefer on-card. I am glad the refractors are on thicker card stock now keeping them from curling but man it’s been over 10 years Topps- fix the curl on Chrome. Prizm is figuring it out and they’ve been around half as long as Topps Chrome. 2017 Topps Chrome Baseball Update MEGA BOX Sealed-Judge Bellinger Voit RCs? ?